It was a formative experience. Hip-hop artists rap over doctored beats from FFVII. I did a million sketches of different compositions until I settled on this. I usually prefer to do something figurative if I can, but the sword was the only thing that felt adequately... respectful... of the strange space that this game occupies in my life. This is way fun. I will always love old-school game homage. BUSTER SWORD! One of the few games I've ever played out in its entirety, I love FFVII to bits. I love this game too. Could never figure the story out though. one of my favorite things you've ever done. FF7 is a close second to secret of mana in my list of childhood inspirations. I can't place why, but there's something about this piece that has a Mignola feel to it. 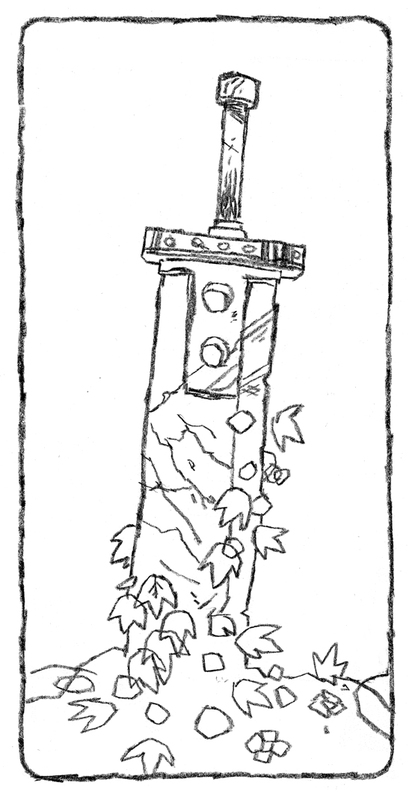 The sword just feels so steeped in Mythological history. I could never play FF unless I was completely free of obligations. And yeah, I know why you did those mignola leaves - I can read minds. FF7 was never worth the praise it got, i felt. But i couldnt have thought of a classier way to pay tribute. 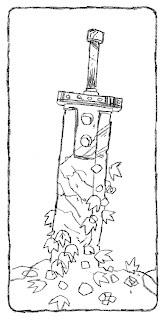 Master-Sword style from SNES zelda.